Musical fan? Love jazz dance? Or just very curious to learn more about jazz based choreographies seen in Musicals like CATS, Chicago or Fame? Then join the 4-week course Musical Jazz with Michelle. Jazz dance evolved on Broadway in the 1950s into the new, smooth style that is taught today. This performance style of Jazz was popularised to a large extent by Bob Fosse’s work, such as the Broadway shows Chicago, Cabaret and Sweet Charity. 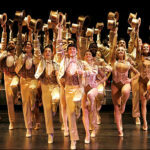 This style is used in large scale musicals today as well such as Fame, Wicked and Grease. In the Musical Jazz classes we will use technical jazz dance as the foundation, and we will work on expression, technique and musicality. Besides working on technique (jumps, leaps, turns) and expression, the class will also be dedicated on learning choreographies and combinations inspired or from all of your favourite musicals like CATS, Fame, Grease and Chicago.